If we be honest with ourselves, money and the pursuit of it can be every bit a curse as it can be a blessing. But some people not only climb to the top but also become some of the richest people in the world. Through determination, grit, and a bit of luck they overcome their circumstances and achieve extraordinary success. An American business person, investor, and philanthropist, Bill Gates at the age of 60 is known as the richest person on earth. He is the founder of Microsoft and his business worth is $79.3 billion. He was born in Seattle and was ranked as the fourth most powerful person in the world in 2012. Born in Busdongo de Arbas, Leon, Spain, Amoncio Ortega is a Spanish business magnet. He is the chairman and founder of the Inditex and is known for its chain of Zara clothing and accessories retail shops. At the age of 80, he is ranked as the richest person in Europe and as the second richest person in the world. The Net worth of his business is $78 B. Another business investor and a philanthropist is Warren Buffet who at the age of 86 is considered as the most successful investors in the world. His business worth is $65.9 billion and was ranked as the world’s wealthiest persons in 2008. Jeff Bezos is an American technology entrepreneur and investor playing an active role for the growth of e-commerce. He is the founder and chairman of an online merchant of books Amazon.com with business worth $65.7 billion. An American programmer, internet entrepreneur, executive, and philanthropist, Mark Zuckerburg is a 32 year old chairman of the social networking website Facebook. His business worth is around $54.7 billion. Founder of the Oracle Corporation Larry Ellison was listed as the third wealthiest person in America in 2014. He is currently the executive chairman and the chief technology officer of Oracle with a net fortune of $50.5 billion. Carlos Slim Helu is one of the richest self-made billionaires in the world who owns more than 200 companies in Mexico. The net worth of his fortune is $49.9 billion and he built a giant empire across Mexico and abroad. Michael Bloomberg is also the riches t person on earth with an estimated net worth of business around $46.4 billion. He is a politician, philanthropist, and an American business magnet. He is the founder, CEO, and the owner of Bloomberg L.P.
At the age of 80, Charles Koch also stands among the richest people on earth. He is the co-owner, chairman of the board, and the chief executive officer of the Koch Industries. His fortune is worth $42.1 billion. Avid Koch is the brother of Charles Koch and serves as the executive Vice President of the Koch Industries. His fortune is also worth $42.1 billion and shares control over sales with his brother. A French heiress, socialite, and a business women, Liliane is one of the principle share-holders of Loreal and is regarded among eth riches women in the world. 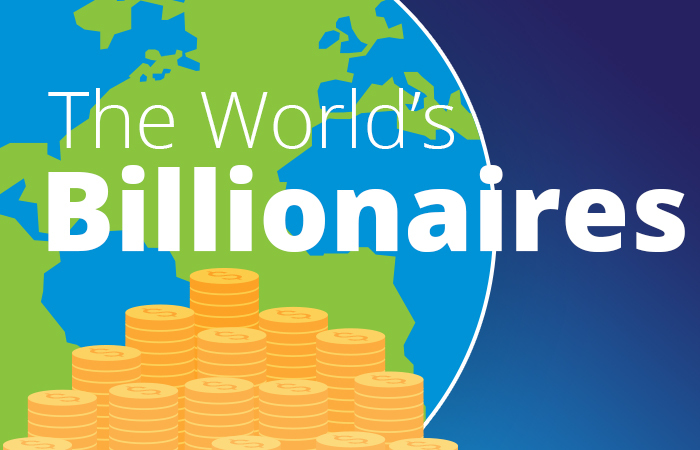 Her net fortune is worth $39.6 billion making her the eleventh riches person on earth. An American computer scientist and an internet entrepreneur, Larry Page is the co-founder of Google. He is also among the richest people with a business worth $38.1 billion. Sergrey Brin is the Russian born American computer scientist, internet entrepreneur, and a philanthropist who co-founded Google. He is the president of Google’s parent company, Alphabet Inc. with a business worth $37.2 billion. Jim Walton is the Chairman and CEO of Arvest Bank Group Inc. he is the youngest son of Sam Walton, the founder of the world’s largest retailer, Walmart. He is ranked fifteenth among the riches people in the world with a net worth of $34.5 billion.